Captain America 2: The Winter Soldier hit theaters this weekend bringing in an astounding $96+ million before the weekend was even over. With this film far outdoing it’s predecessor in both money and plot, what made it so special? I could go on and on about the amazing character banter or the Winter Soldier’s post credit scene. Instead I condensed the film into its Top 5 most important moments. We’re starting off this countdown with something we’ve never seen in the Marvel Cinematic Universe before: an honest to God car chase! Add in Samuel L Jackson as Nick Fury and you have one of the most heart racing scenes I’ve seen in quite a while. Add in Samuel L Jackson’s story about the filming of this scene and it gets even better. This felt like something straight out of the Bourne Ultimatum. I had seen part of this scene a few days prior on The Daily Show. So when those two cop cars pulled up along side him, I knew it was coming. Still, WOW! It was even more intense than I could have imagined and deserves its stop at #5. 4: Maria Hill Steps Up! 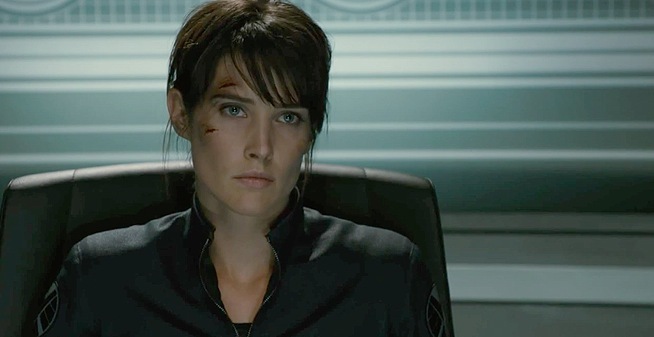 Since we first met her in The Avengers, Maria Hill has always been a very secondary character whose motives weren’t that clear. If you saw the deleted scenes and alternate endings in The Avengers you know exactly what I’m talking about. She was either just ‘there’ in the background or standing against something Nick Fury said. Though after this film, her allegiance will never be called into question again. When it seems as though all of S.H.I.E.L.D. is on the hunt for our heroes, Hill swoops in and saves them by going under cover as one of the riot police charged with escorting the prisoners. This film she stepped up and took on a much larger role and it seems as though this will continues. By the end of the film, we saw her applying to work at Stark Industries – probably in Avengers Tower which Stark has been hard at work completing. Note: At the theaters, I heard a lot of people upset with Cobie Smulders after the How I Met Your Mother season finale. Remember folks, Cobie didn’t write the ending. So whatever your thoughts were of its ending, don’t let it affect how you perceive her here. Cobie did an amazing job as Maria Hill and I can’t wait to see more of her. Unlike the film, the body in the initial trailer was fully covered as to not give anything away. I predicted months ago that Nick Fury would fake his own death and come back later in the film. Though despite being 99% positive, I still shed a tear or two when we say his body lying there in the morgue. Seeing him alive in that hospital bed and listing off his injuries like he had seen worse was just perfect. And seeing his swagger when he got off that helicopter and walked into S.H.I.E.L.D. headquarters was even better. Long Live Nick Fury! If you missed this scene then you’ve learned nothing from Marvel movies – or comic book movies in general. You always stay for the credits because there’s inevitably a scene that sets up for future films. This post credits scene introduced Baron Von Strucker who is the head of the new Hydra and will play the role as villain in a few of the upcoming films. Here we see how he and his team are still quite advanced despite S.H.I.E.L.D. being taken down. In secret they have been conducting experiments with Lokis staff from Avengers. Thus far all test subjects have died except 2 – the twins. These are Quicksilver and Scarlet Witch who will both appear in Avengers 2: Age of Ultron as enemies turned allies. Originally these characters are from the X-Men universe, though with Fox owning the rights to that franchise, Marvel Studios has had to invent a new backstory for these two besides mutants. Who knows, perhaps even Ultron himself will be created down here in this secret Hydra base. Truly the biggest shock and awe moment of this film had to be when Dr Arnim Zola revealed that Hydra had been growing inside S.H.I.E.L.D. ever since it was first created. The repercussions of this are so big that nothing will ever be the same – not the films nor the TV show aptly name Agents of S.H.I.E.L.D. . Looking back we could see some slight signs, such as the production of Hydra weapons in the first Avengers. But to think that much of the organization was corrupt is just unimaginable. You can never be sure who is trusted and who is whispering Hail Hydra under their breath. Even Senator Stern from Ironman 2 and the lovable Agent Sitwell were traitors. The directors were right. This film has undoubtably changed the landscape of the Marvel Universe and set up for Avenger 2: The Age of Ultron perfectly. With the security agency destroyed, the fate of the country and the world lies in the hands of heroes now. It looks like the Avengers are about to get their official headquarters – along with their own logo judging from this set photo from Avengers 2. 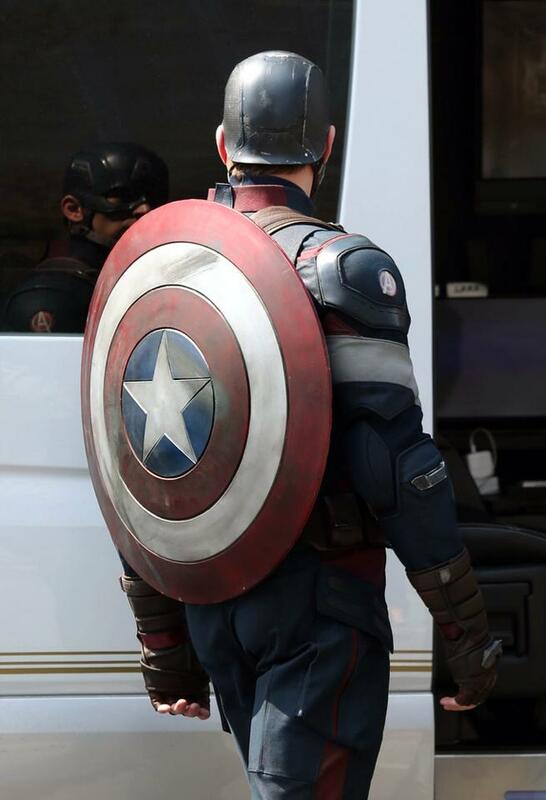 Look at the right shoulder of Captain America’s new costume from the set of Avengers 2: The Age of Ultron. Avengers-logo FTW!